The Baseball Federation of Japan (BFJ) appointed Japanese Baseball Hall of Famer Masatake Yamanaka (71), Vice President of BFJ, as its new President to succeed Norio ICHINO (77) on May 29. At the same time, total of 21 Executive Committee Members have been chosen including the 3 Vice Presidents: Masayuki NAITO (Japan Student Baseball Association, All-Japan University Baseball Federation), Toyomi MUNAKATA (Japan Rubber Baseball Association) and Toshiyuki YANAGI (Japan Amateur Baseball Association. (More details under “ABOUT US”). New BFJ President YAMANAKA, native of Oita, Kyushu, renowned amateur baseball skipper and amateur manager, led National Team Japan to its first Olympic Medal in baseball at the Barcelona Olympics in 1992. As an ace pitcher at Hosei University, he holds an unbroken record of 48 wins in the Tokyo Big6 League, played at Sumitomo Metal Baseball Club of industrial league and was its manager in 1981. From 1994 to 2002, he managed Hosei University and worked with NPB’s Yokohama BayStars Club as Executive Managing Director in 2003. After retirement, he was an associate professor of Hosei University, served as Director of Baseball Federation of Japan and enshrined in Baseball Hall of Fame in Japan in January, 2016. 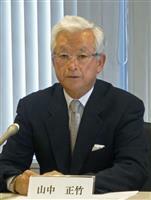 It is a great honor to be appointed President of Baseball Federation of Japan. I am determined to exert all my strength for the good of baseball. Public interest and high expectation in baseball/softball is growing as it returns as an official sport at 2020 Tokyo Olympics and Paralympics, in particular on Team “Samurai Japan”. I earnestly wish that Samurai Japan will win Gold Medal by displaying its great skill and solidarity so that it may inspire, joy and share wonders of baseball with many people. On a serious note, baseball community is faced with huge problem of decrease in player numbers which is alarming because number of children to play baseball in primary and junior high schools go below the declining birthrate. This calls for urgent attention and goes with another most important issue, namely development of baseball. I will work closely with the Japan Baseball Conference jointly established by BFJ and Nippon Professional Baseball as a core, and other member federations and interested organizations to ensure lest baseball should ever lose radiance. Further, I will not fail to promote globalization of BFJ as member of World Baseball Softball Confederation to represent controlling body of baseball as National Federation. Again, I will strive to enhance BFJ’s presence on international plat home with the help of relative organizations.